Dr. Björn Bieber, patent attorney and partner of our law office, studied and obtained his doctorate at the universities of Leipzig and Jena. His main subjects were microbiology, biochemistry and biophysics. He was involved in genetic engineering at the ETH Zurich under a research grant from the German Academy of Natural Scientists Leopoldina. From 1994 to 1998, Dr. Björn Bieber studied law at the university of Jena and has been working in the field of industrial property rights since 1999. 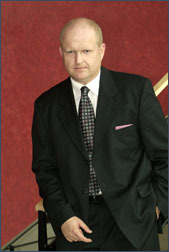 He is licensed as a Patent Attorney and a European Trademark and Design Attorney.